The mission of Voelker Orth Museum is to perpetuate Elisabeth Orth's interest in preserving the historical and cultural heritage of Queens and Long Island, and to disseminate knowledge in these areas for the benefit of the ever-changing population of these communities. 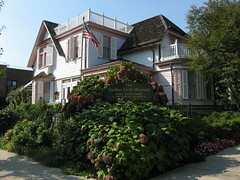 The Museum, Bird Sanctuary and Victorian Garden occupies a home that was purchased by a German immigrant named Conrad Voelker who emigrated from Germany in 1881. After his death in 1930, the house became the home of his daughter, Theresa Voelker and her husband, Dr. Rudolph Orth. Their daughter, Elisabetha Orth, who lived in the house most of her life, in her will established the organization which now runs the museum. The immediate goal of the organization was the restoration of the Voelker Orth homestead. A distinguishing feature of the museum is the garden, containing plants that were once regular favorites in the Victorian era. The garden is maintained using eighteenth century propagation methods and gardening techniques, such as hand pruning and the use of natural fertilizers and pesticides. Serving as a sanctuary, the garden’s many varieties of berry bushes and trees attract migrating birds, such as orioles, mockingbirds, and hummingbirds, as well as local species like cardinals and blue jays. In June and July, our butterfly bush attracts monarchs, swallowtails, and other species, and our bee hive is home to a thriving colony of honey bees which produce a modest amount of honey for our educational programs.